We are looking for the best 3 on 3 basketball players in the west to compete in the 7th annual Fast Eddy's BAM Jam August 9-10 in Boise, Idaho. And if you have what it takes, we will take care of you. Of course, there are divisions for players of all ages and abilities. But players in the elite divisions will all get a chance to play on the Northwestern Mutual Center Court and games are officiated by certified high school and college officials. Teams get a VIP treatment at team check in and receive parking passes right next to tournament in our VIP parking lot. BAM Jam has a tradition of hosting some of the best 3 on 3 basketball players and teams. Our past champions include winners of the Hoopfest Elite Division, former professional, Division I, Division II and NAIA players. The champions all receive championship packages worth hundreds of dollars and, of course, the highly sought after champions shirts printed on Nike apparel. The Northwestern Mutual Center Court will feature elite division games all weekend long. The Northwestern Mutual crew will set up to take care of our elite players. A shaded canopy and ice cold water for elite team members are just a few of in game perks Northwestern Mutual will provide. Northwestern Mutual is no stranger to big sporting events. As a proud partner of the NCAA and the presenting sponsor of the Rose Bowl, Northwestern Mutual understands the importance of sports and the impact that they have on the surrounding community. BAM Jam is excited to host the best 3 on 3 basketball players in the northwest. 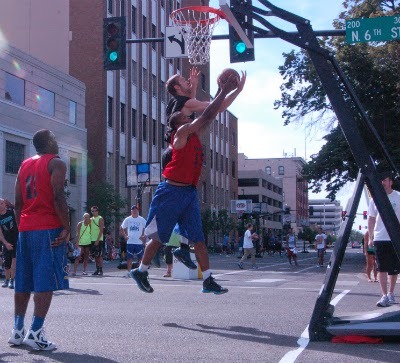 If you are interested in competing in the 2014 Fast Eddy's BAM Jam, click here or go to the "PLAY" button at the top of the www.bamjamboise.com webpage.